UPDATE — Nov. 3, 9 pM ET: See my comment below; there is solid evidence that this insignia does not have a nefarious signification; only one which is apt to be misunderstood in the present political climate. (Nov. 2, 2009) — You can’t get more explicit about your agenda than the art you use to advance it. And a case in point is the new insignia of the 5th Army North, a combat unit formed to assist in civil defense in times of National Emergencies, within the United States. The ony problem is that the logo has an image of the American Eagle, taken from the President’s crest, superimposed upon the Continent of North America. With the continent surrounded with an ocean in the colors of the United Nations peacekeepers. To add artistic insult to symbolic injury, at the heart of the Eagle is a Red Card, with what appears to be the silhouette of an Islamic Tower! This insignia was found on 2 mobile command units, recently acquired by the 5th Army North, stationed at Ft. Sam Houston. The imagery speaks for itself: a North American Union task force for integration. Biographies of commanders at the U.S. 5th Army north are in English, French, and Spanish. They want the entire Continent to know they are ready for them! If there was every any question that the top Brass are in favor of the North American Union: these insignia indicate that they have already accepted the idea and are implementing it. This might be the payback for supporting the Obama regime: top Brass get military power over entire continent! It is not known what the Ambassadors of Canada and Mexico would think, seeing the American Eagle superimposed over their own nations. Read more about this story at Infowars.com. 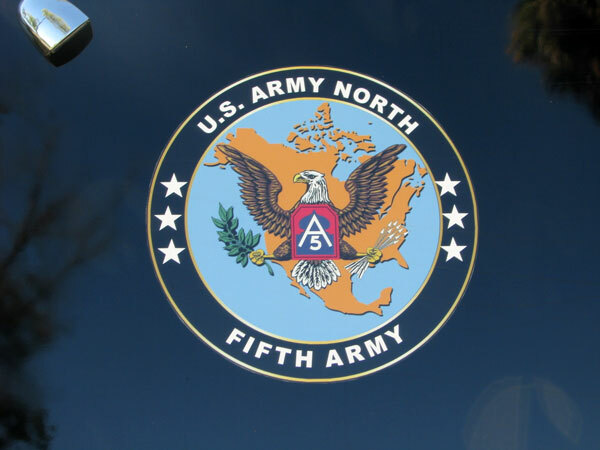 Visit the U.S. 5th Army North’s website at http://www.arnorth.army.mil/. 9 Responses to "New Seal for 5th Army North symbolically declares North American Union"
Mr. Charlton replies: I welcome commentors who want to present facts; but you have not presented any proof of your statements. SHOULDER SLEEVE INSIGNIA. Description: On a red rectangular background with top corners chamfered at 45° having a 2 1/2 inch (6.35 cm) base, 2 3/4 inches (6.99 cm) in height and top 1 3/8 inches (3.49 cm), a silhouette of a mosque in blue charged with a white letter “A” 1 9/16 inches (3.97 cm) in height, members 3/16 inch (.48 cm) in width above a white number “5”, 11/16 inch (1.75 cm) in height, members 1/8 inch (.32 cm) in width. Symbolism: The flag colors of red, white, and blue are self-explanatory. The outlined figure of the mosque is symbolic of the country in which Fifth Army, the previous designation of the unit, was originally activated. The letter “A” indicates “Army”, and conforms in general, to designs used by the First and Third United States Armies. Background: The shoulder sleeve insignia originally approved for Fifth Army on 26 January 1927, was pentagon shaped with a white background and five red stars formed in a pentagon shape. The current design was originally approved for Fifth Army on 7 April 1943. It was redesignated for the Fifth United States Army effective 1 January 1957. The insignia was redesignated for United States Army North with the description and symbolism updated on 19 December 2006. The Blue mosque is adapted from the Fifth Army shoulder sleeve insignia and refers to the initial activation of the Headquarters, Fifth Army, in Morocco, North Africa on January 5, 1943. Either the badge-making authorities are completely clueless, or they have outfoxed themselves by anticipating. Never underestimate the audacity of power. Mr. Charlton replies: CE, I think this one link debunks the entire controversy over the 5th Army North’s seal/badge/insignia. Thanks! — I would personally like to see the US boarders put in, though; like they are in the joint forces command badges. — I will leave my report as is, to show that I sometimes get it wrong too. The eagle symbolizes our great nation and our alertness, ready to defend our homeland. The olive branch symbolizes peace. The group of 13 arrows symbolizes war and represents the first 13 states. The eagle’s head is turned toward the olive branch, indicating our desire for peace. The shield symbolizes a warrior’s primary piece of defensive equipment. The 13 alternating red and white bars on the shield represent the 13 original colonies. The chief, in blue, holds 13 six-pointed stars, a reference to the six-pointed design from General George Washington’s personal flag. A depiction of U.S. Northern Command’s area of responsibility (AOR) is in the background, shielded by the eagle. On the AOR are three stars, a remembrance of each of the sites of the Sept. 11, 2001 attacks. The stars are gold, a symbol of those who lost their lives. The gold star accorded the rightful honor and glory to people for their offering of supreme sacrifice for their country. The five stars at the top of the crest represent the five services: Army, Navy, Air Force, Marine Corps and Coast Guard. The stars are eight-pointed, representing the eight points on a compass and symbolizing our mission to counter the global threat of terrorism. The stars are lined up over the AOR, depicting the umbrella of protection that USNORTHCOM provides North America. The outside rings of red, blue, and red with the white lettering of the command’s name represent the colors of the nation and national flag. USNORTHCOM’s AOR includes air, land and sea approaches and encompasses the continental United States, Alaska, Canada, Mexico and the surrounding water out to approximately 500 nautical miles. It also includes the Gulf of Mexico, the Straits of Florida, portions of the Caribbean region to include The Bahamas, Puerto Rico, and the U.S. Virgin Islands. The commander of USNORTHCOM is responsible for theater security cooperation with Canada, Mexico, and The Bahamas. I don’t want to dismantle your interpretation, only offer facts. The “onion dome” image has been in use since the inception of the 5th, I believe in 1946. It’s always been assigned to the North American region of protection for quite awhile now. We have 16 separate units/corps that are assigned to different regions and different tasks. The 5th just happen to draw the “North American” region. Please don’t be alarmed by this. However the Eagle over the North American continent is a “new” logo, but does not imply a new development or idea. Keep up the good work. I read your posts daily…..carry on. Mr. Charlton replies: I welcome commentors who want to present facts; but you have not presented any proof of your statements. Neither does the link, other than to show that no other Army unit has religious symbols. I would think that Muslims would also be offended, as if to think that the 5th Army North stations troops inside Mosques or has anything to do with their religion. Can you imagine what the public reaction would be if an Army unit had their letters inside the silhouette of Notre Dame at Paris or St. Peter’s at the Vatican? Anyhow, the silhouette is only a periferal issue. Its the Eagle spreading his wings over the continent and the lack of U.S. boarders, which boarders the U.S. Military is charged with defending, which is the issue. Shows a lack of awareness, to say the least. Just had this fleeting thought at this late hour while listening to Alex Jones podcast from last hour yesterday’s show going over the actual document called the Copenhagen Treaty. 1. The video that surfaced a few days ago (not yet vetted) about recent orders that hers and other units covering the border received mandating they must be gone and have their areas cleaned up by December 31st. 3. Copenhagen conference happens in 35 days. Thanks, John, for posting this. I find it disturbing. Is this for real? What is teh US 5th army North-regular military or Obama army?